New for Spring 2019 – A series of workshops to help you to bring mindfulness into your everyday life. Come to one or come to all. Get in touch to learn more and book your space. There are a range of classes, courses and workshops on offer with Discovering Mindfulness and we are continually devising new options to respond to everyone who is interested in learning more. Please scroll on to find something that suits you right now, from taster classes & courses, to full day practices and longer 6 & 8 week courses. Individual consultations can also be arranged on request. Please note that advance booking is essential for all classes and courses. You are welcome to contact me to learn more! Intention: To practice mindfulness meditations with a small group and reflecting on different aspects of experience. These classes are ideal for those who wish to try mindfulness for the first time, remember a practice or simply to share a practice with others. When and Where: Monday class at 6.30 pm at Phoenix Yoga Studio, Marketpoint, Mullingar. When and Where: one Friday each month, 12.00 – 12.45 pm at Phoenix Yoga Studio, Marketpoint, Mullingar. Intention: This series of workshops offers an opportunity to learn about mindfulness through experience. 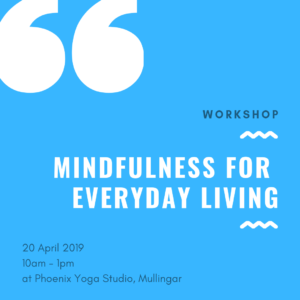 Each workshop will focus on a particular theme or aspect of mindfulness and will include some group discussions, interactive exercises and meditation practices. Practices for daily life will be shared so that we can continue to build our mindfulness or awareness muscle in any moment. Come to one or come to all. Where: Phoenix Yoga Studio, Mullingar. I offer day retreats that allow us find our inner stillness, silence, peace and calm. I also co-teach on MBSR retreats in France (/https://www.retreatsinfrance.com) and mindfulness teacher-training retreats in Spain (http://mindfulacademy.eu). Intention: Each day explores a theme and offers time to gently explore through a variety of mindfulness practices. Themes including: “Nourishing”, “Well-Being”, “Replenishing” and “Restoring Energies” and may include talks, meditations, walks and nurturing meals in country surroundings. When we stop and invest in ourselves in this way, the value extends beyond the immediate experience to the rest of our days and weeks. A gift of a day for yourself (and friends!). See what others have said who joined us for this day retreat. Cost: €65 (Includes nutritious lunch!) Discounts for early booking with deposit. Join us for a series of mindfulness practices that will focus on bringing awareness to this sensational life. This day will be a silent day and is best for people who have some experience of practising mindfulness, yoga or similar breath/body practices. These morning ‘urban’ retreats are offered to support a sustained practice of mindfulness. The fee is to cover basic costs. After the flurry of commitment as part of an 8 week course, continued sustained practice allows us to nourish and nurture the seeds planted. Yet we can also lose our momentum. The morning of practice allows us to reconnect with our intention to practice mindfulness in our daily lives, to reconnect with fellow practitioners on this journey and to support each other. We practice together through guided meditations from the core MBSR curriculum, mutual sharing of poetry and other inspirational images and music that help us stay committed and connected to the practice. Please contact to book your place. I am an accredited MBSR teacher and I am also trained to teach the .bFoundations programme that was designed for adults and older adolescents in education. These programmes hold the best evidence for significant impacts in reducing stress, anxiety, pain and increasing low mood and general well-being. If you enjoyed the taster experience and wish to make mindfulness an everyday experience, these are the next steps. Discounts also offered for returning participants who are continuing to deepen their mindfulness and meditation experiences. 1. Mindfulness for Stress Reduction (MBSR) – 8 week programme. Intention : MBSR is the ‘gold standard’ programme that gives people the opportunity to develop an individual personal practice. This is the programme that has been most widely researched and yielded significant health benefits for people, physically and psychologically. Learning new skills takes effort and repeated practice. This programme gives beginners the space to learn the skills of mindfulness in a supportive small-group setting. See what others have said who have taken this course. Duration : 8 x 2.5 hour workshops + 1 retreat style day 10am – 4 pm. Cost: €295 for full course. Discounts for Early Bookings with Deposit and for returning graduates. Contact me to learn more. Spring/Summer 2019: 9th – 15th June & 30th June – 6 July 2019 – Residential Retreat in France. Join us in idyllic rural France, near the midi-Pyrnees, where we will cover the MBSR Core Teachings in the week. Come enjoy the panoramic views of french countryside, some gentle hill walks and sample the atmosphere and local delicacies on market day. Limited spaces so early booking essential. More details are at www.retreatsinfrance.com. Please contact me for more information and to register your interest in a future day time or evening option. 2. Finding peace in a Frantic World/ .bFoundations. Intention: This 8 week evidence-based programme is designed to introduce people to a set of simple yet powerful practices that can be brought into daily life to help us to break the cycle of anxiety, stress, unhappiness and exhaustion. It helps us to reclaim our well-being as we try to keep up with the relentless demands of the modern world. 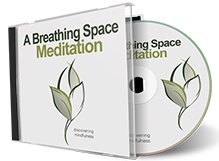 ‘‘A coherent, compelling and common-sensical 8-week programme for anyone caring about his or her own health and sanity, especially in this increasingly fast-paced and, as they refer to it, frantic world.’’ – Jon Kabat-Zinn. For people who are working in the education sector or parents whose children are taught mindfulness curriculum in school, .bFoundations was developed and incorporates the Finding Peace curriculum in addition to practices that are taught to children in schools. Both are based on the core principles of Mindfulness-Based Stress Reduction (MBSR) and Mindfulness-Based Cognitive Therapy (MBCT) and for this programme, tailored to make the course accessible and effective for busy people. Participants will learn practical ways to feel calmer and more present in their everyday lives, in work and communication, cultivate compassion and experience mindfulness teaching from the inside-out. More on this page. Duration: 8 x 1.5 hour or 6 x 2 hour workshops. Cost: €175 for 8 sessions, course handbook and audio recordings (also 50% discount on a retreat day of practice). Intention : I welcome every opportunity to discover with people how mindfulness can help us in everyday life. Duration : To date I have developed bespoke options from lunchtime meditation classes to two-hour workshop style introductory sesssions tailored to the specific needs of you or your group/organisation. When and Where : To date I have developed tailor-made options for local community groups, health support groups, national education and training programmes and international business organisations. Individual consultations and programmes are also available on request.